Baldfaced Hornets: These are the wasps that build the familiar looking “hornet nests” hanging in a tree, bush, or sometimes on the overhang of a house. 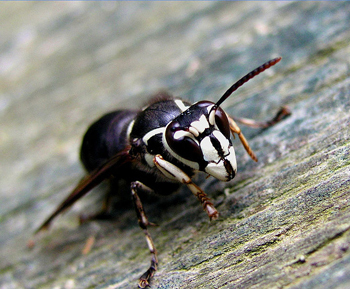 The baldfaced hornet is not a true hornet. It is morphologically a large yellow jacket species. They are major predators of flies, caterpillars, earwigs, and even their smaller yellow jacket relatives. In this regard they are beneficial insects. However, sometimes they will locate their nests a little too close to our homes and removal is then warranted. Baldfaced hornets can actually spray venom from their stingers (in addition to stinging) the venom can get into a persons eyes. 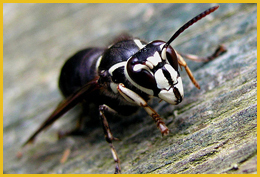 The Wasp Expert will completely and safely remove baldfaced hornets and their nests from your home. 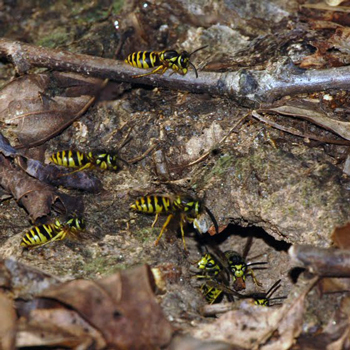 In-ground Yellow Jacket Nests: Yellow jackets will often nest in the ground utilizing an old decayed root passage or an abandoned mouse or chipmunk burrow tunnel. The workers will continually excavate the soil cavity all summer (you can see them leaving the nest entrance with dirt pellets in their jaws) so the nest can grow and more workers will hatch out to help the colony expand. Like the baldfaced hornet, these yellow jackets are beneficial in that they will kill many species of flies, caterpillars, and other small insects they can overpower to feed their larvae. Unfortunately, it is when yellow jackets nest in lawns, walkways, and places people and pets frequent removal is necessary. 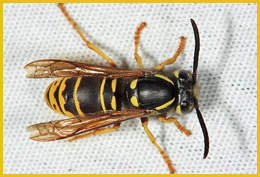 The Wasp Expert will completely remove in-ground yellow jacket nests. 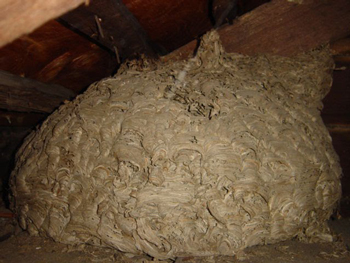 Structural Yellow Jacket Nests: Perhaps the most immediate stinging insect problem is when a colony will nest inside of the walls or attic of a house. Yellow jackets prefer dry dark locations to nest and the structural voids of a house or building provide that type of environment. Nests can be inside of attics, barns, sheds, soffits, outbuildings, or behind the ceiling or drywall of a home. A sign of a yellow jacket nest in the structure is a “crackling” or a “scratching” sound one can hear coming from inside the wall. The insects chew away the insulation and drywall so they can expand the nest. There can sometimes be a wet mark on the drywall as well and they can break through into the living space of the home if not removed. DO NOT spray or plug the entrance to a structural nest. See the “Frequently Asked Questions” section for more information. The Wasp Expert will remove structural yellow jacket nests. European Hornet: This is the only true hornet found in Pennsylvania. The European hornet is the largest of the social wasps being over an inch long. They look like large yellow jackets and you can hear a low hum when they fly. European hornets are unique in that they can forage at night unlike any of the other social wasps and bees in our area. They can fly around outdoor light fixtures and bang against the glass of lighted windows. The European hornet will nest inside of wall cavities, attics, hollow trees, chimneys, and sometimes in the ground. The Wasp expert will remove European hornets. 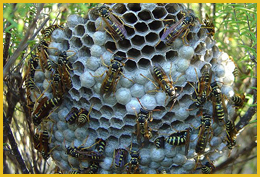 Umbrella Wasps: These wasps are the ones that will build the open paper comb nests (sometimes called paper wasps). Umbrella wasps are great predators of caterpillars and will often clean a garden of nearly all caterpillars to feed their larvae. 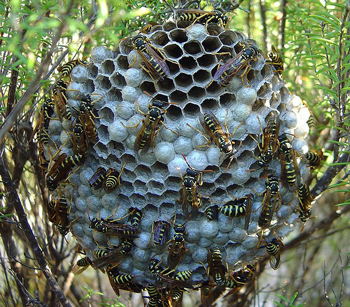 Umbrella wasps are less aggressive than their yellowjacket relatives. Nests can be found under eves, shutters, under railings, lights, and some other interesting places. When nest removal of umbrella wasps is necessary The Wasp Expert will remove them. 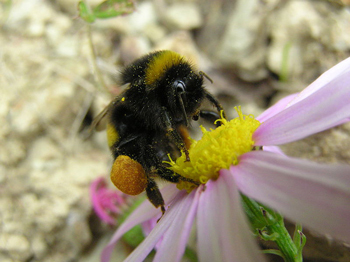 Bumblebees: These big furry bees are important pollinators. It is the bumblebees that are our native pollinators as the honeybee was brought to this country from Europe. Bumblebees will nest in compost heaps, insulation of a house, mattresses, or other places like birdhouses. The bumblebee nest is a cluster or wax “bubbles” and contains honey. Unlike the honeybee, bumblebee colonies will die off with the onset of cold temperatures. Like yellowjackets, bumblebees are aggressive in defense of their nests. 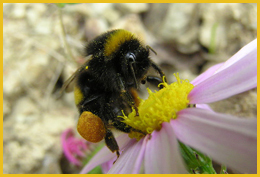 In situations where bumblebees are nesting too close to humans the nest will need to be removed. The Wasp Expert will relocate bumblebees whenever possible because they are important pollinators of our flowers and crops.